Charming, well appointed space on 1st floor of residence in lovely Carroll Gardens. Technically a mother-in-law suite, the completely renovated space offers its own entrance and lots of privacy. Located in in Carroll Gardens, one of Brownstone Brooklyn's most charming neighborhoods, just 15 minutes away from Manhattan by subway. 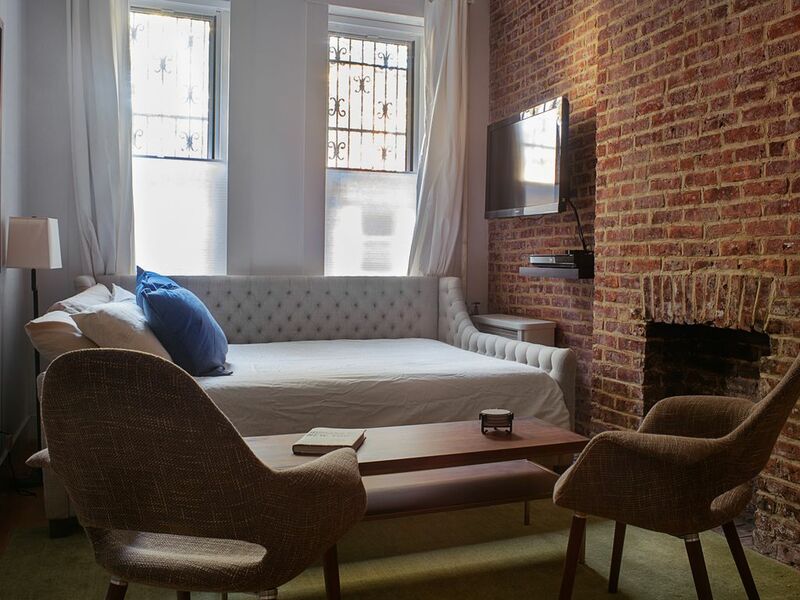 Ideal for 1-2 people, the architect-designed space features exposed brick, tall ceilings, maple wide-plank flooring, and a queen-sized bed with Frette linens. The fully equipped kitchen with breakfast bar has stainless steel appliances including a four-burner stove, microwave oven, refrigerator/freezer, and Fisher & Paykel dishwasher. The bathroom has a spacious shower with custom glass door, Toto toilet and Hans Grohe plumbing fixtures. The apartment comes equipped with Internet access, and a Sony TV with Apple TV, Hulu and Netflix. Access to the apartment is up one small set of exterior stairs. There are no interior steps to climb. Nearest subway station is a five-minute walk (F and G lines; Carroll St. stop). The subway is five minutes away. The surrounding brownstone neighborhood exudes charm and offers the visitor a bevy of exciting restaurant options. The acclaimed eateries Prime Meats, Frankie’s and Buttermilk Channel are just a stone’s throw away, while Smith Street’s well-known restaurant row is about 10 minutes on foot. A well-stocked grocery store and a wine shop are located down the block. This Carroll Gardens space offers the best of all worlds: Brooklyn and its hip, delicious and old world charms yet with Manhattan just 15 minutes away. I am a teacher, a mom of two teenage boys and a travel nut. I've lived in France and England and loved the experience of meeting new people and trying out new things. I try to get abroad as often as I can. The studio is extremely comfortable, cozy and well designed, and has everything you need for a short-term stay. It is situated in Carroll Gardens neighborhood, one of the best of Brownstone Brooklyn. We have amazing restaurants and lovely boutiques, yet are just 15 minutes away from Manhattan by train. Brooklyn is the best of all worlds. Outside staircase to building has five steps. Loved my stay here on 4th place. Very comfortable and cozy, felt like home. Subway just a few blocks away. The neighborhood has many city conveniences, yet with a small town charm. Hope to make many more visits to Stephanie's studio. The studio apt was perfect for our stay in Brooklyn. It was well appointed, clean, and quiet. We had a great week-long stay at this studio--lovely, quiet, convenient Carroll Gardens location; clean, well-stocked apt with a pretty, comfy bed; Stephanie welcomed us to the studio the first night and was right nearby and available if we needed anything. Would love to stay here again! Amazing location , very clean appartment . Quiet neighborhood with great dining options. Most gracious hostess! I would come back in a heartbeat. Stephanie was a gracious hostess. She's a great communicator and gave clear instructions on how to get here and in. We had a private apartment, which was clean and had what we needed. It was steps from the building's entry, so very easily accessible with our bags. All modern appliances were easy to use. Great feeling of space and very charming. The grocery was close by with gluten free/dairy free and vegan options plentiful, kind of like a mini Whole Foods. People were friendly in the neighborhood. My daughter and I felt safe in the neighborhood and building. There is a subway station 2 blocks west and one block south-a 5 min walk. The F and G trains stop there. The F will take you directly to downtown and many popular locations. It stops at East Broadway downtown, 4th Ave, 14th, 23rd, 34th and on up to Central Park/Uptown and beyond. Getting off at these puts you a short walk away from just about anything you want to do in NYC, if not right there. Very convenient. It takes about 20-30 min to 23rd St. from Carroll Station. A weekly metro pass unlimited is $33, so we went everywhere from here. The rental is A great value for the money. Stephanie is welcoming and truly makes you feel as if her place is your "home away". Highly recommend!